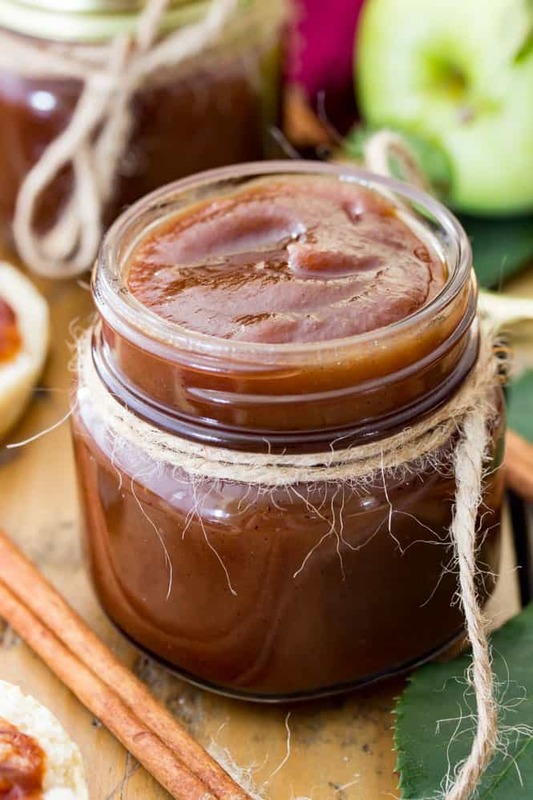 Easy homemade Apple Butter! This simple recipe is made in a slow cooker and requires only minutes of prep time. Thanks to the slow cooker, you can set yours up before you go to bed, let it cook overnight, and enjoy fresh apple butter in the morning. We went apple picking last weekend and I have so many apple recipes coming up for you, but I’m especially excited to share today’s apple butter recipe. 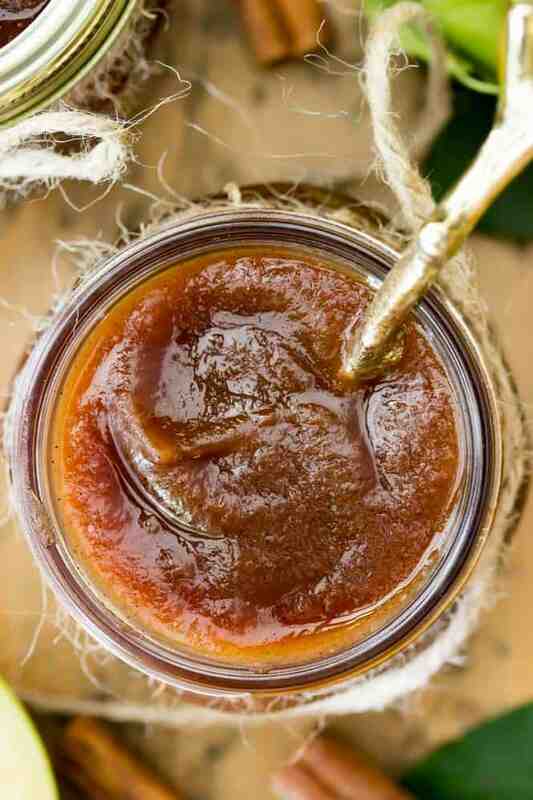 Have you ever had apple butter before? It’s very similar to applesauce — in fact it essentially is applesauce, only cooked longer. 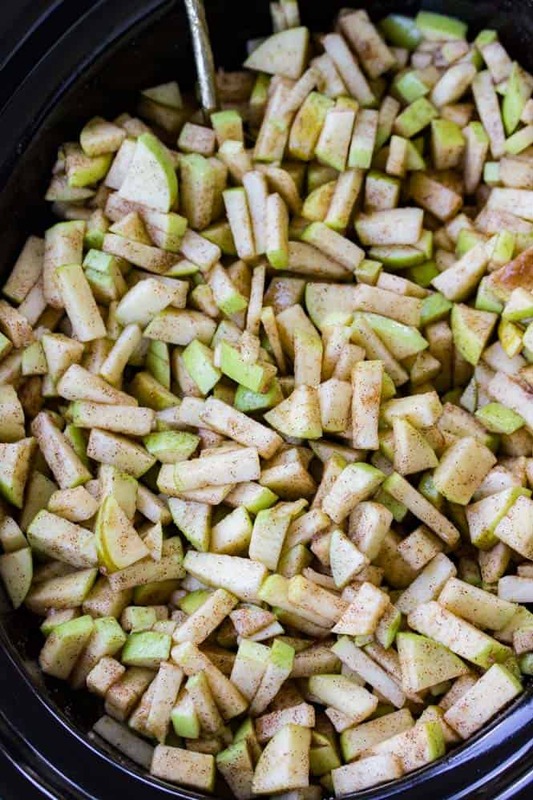 It has a rich golden brown color that comes from the caramelization of the sugars in the apples during the extended cooking time. There’s no actual butter in apple butter, it’s just a nice smooth spread that tastes just as good on toast, muffins, or pancakes as butter does. 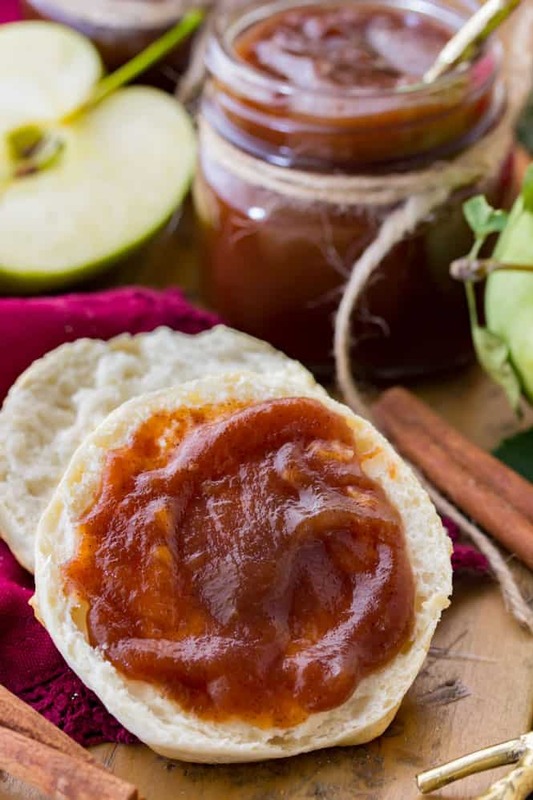 We like eating ours on English muffins and scones, and some of my family members even just like dipping apple slices directly into apple butter and enjoying it that way! Apple butter is really truly easy to make, but it takes a long time to cook… 12 hours total, in fact. Thanks to the slow cooker, you can set everything up before you go to sleep and allow it to cook overnight, which is what I like to do. I put mine in the crockpot before I went to bed and in the morning not only did my house smell amazing, but I had fresh apple butter for my breakfast. The first time I made this recipe I peeled all of the skins off my apples. However, traditional apple butter is made with the skins and cores intact. I couldn’t leave the cores in for this slow cooker version, but I tried making this both with and without the skin and found that it didn’t make a difference at all. Save yourself a lot of effort and leave the peels — after 12 hours in the crockpot and a bout with the blender, you won’t be able to even tell. 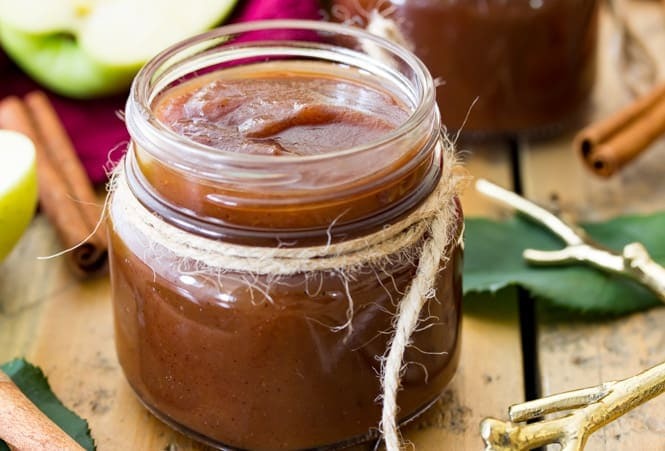 What are the Best Apples for Apple Butter? While Granny Smith apples are a standard baking apple (and I love using them in Apple Crisp), I don’t recommend using them for making apple butter as they are too firm and too tart. Instead, choose a softer and less tart apple. Here are a few popular choices, and you can even mix several varieties of apples if you’d like. Core and chop (don’t peel!) your apples and place them in the basin of a slow cooker. Puree (I like to use an immersion blender (this is mine, affiliate) but you can use a regular blender instead if you don’t have the immersion type. 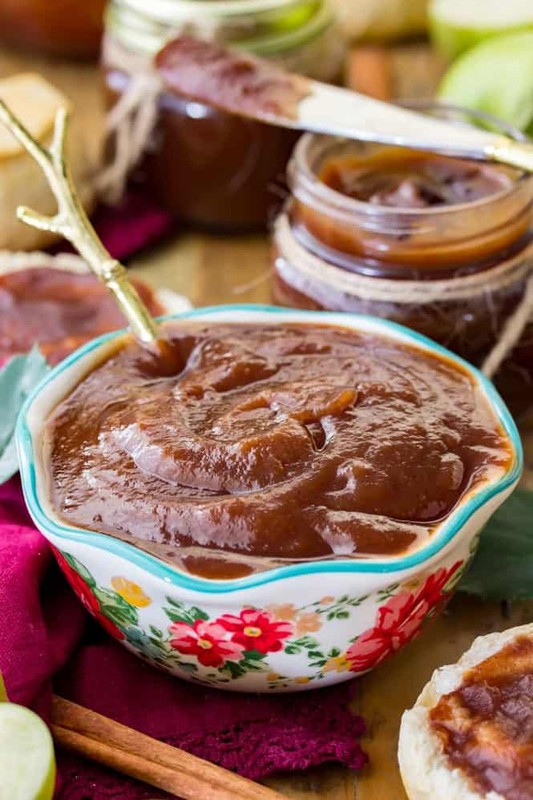 Cook the apple butter another 2 hours without the lid on your slow cooker. These last two hours are important. You’ll add your vanilla at the end here and cook until it reaches the appropriate thickness. If the apple butter is still too thin for your liking you can cook it longer to thicken it. I’ve never needed to cook mine longer than the additional 2 hours, and keep in mind that apple butter will thicken as it cools. Scroll to the bottom of the recipe to see my video, complete with lots of tips! Subscribe to my YouTube Channel and be the first to see all of my cooking videos! 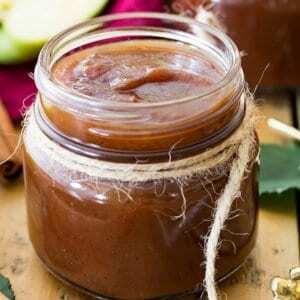 Easy homemade apple butter made in the Crockpot. Recipe includes a VIDEO just below the post! Slice apples into small pieces (about 1/4") and dispose of cores. In a medium-sized bowl stir together sugar, brown sugar, cinnamon, salt, and cloves until well-combined. Pour sugar mixture over apple pieces and stir until well combined. Once 10 hours has elapsed, either use an immersion blender** to puree apples until smooth and no chunks remain. Scrape the inside of the vanilla bean into your apple puree (or add vanilla extract). *Weigh before coring and chopping. For me this was about 13 apples. You do not need to peel your apples. **If you do not have an immersion blender, pour the apples into a blender and puree until smooth, then return to crockpot. Hello, this recipe is amazing. But I was wondering have you tried to cook this on the stove? Just curious as my crock pot only holds 6 pounds of Apple’s but the recipe only yields about 6 8oz jars. I was wanting to use my stock pot to make more then that quantity. Thank you. I have not, I’m sorry! This is going to be my first time attempting to make apple butter and I’ve decided to try this recipe. I just want to make sure I’m not missing anything, does this recipe really not use any type of liquid? Others I’ve read called for water or apple cider so I just wanted to double check. Nope, no liquid 🙂 The slow cooker does a great job of pulling and maintaining all that moisture from your apples. Enjoy! Could i possibly use Honeycrisp apples for this recipe? Have you ever tried processing your apple butter in a water bath to make it shelf stable? I have done it with Jelly. Its easy, just kind of pain. Thinking of doing it with this recipe so I can ship it. Your thoughts, please. Hi, Beth! I am not very familiar with the process, so I have not tried it. I couldn’t provide a recommendation on how it would work. I’m sorry. I was wondering if you tried the water bath and did it work??? This was my first time making apple butter and it turned out great! I especially loved not peeling all those apples. My crockpot is one of the older smaller ones so I halved the recipe and it still made plenty. Tastes amazing stirred into cottage cheese. The best part of the recipe is not peeling the apples. My husband would have a lot of work on his hands peeling my apples for me. 😂 I am so glad you enjoyed it. Will it be okay if I keep cooking it or even put it on warm after I use the blender? I wasn’t thinking timeline when I started it so it technically won’t be done until 2am. Can you use the oven method to sterilize the jars for this recipe instead of the boiling water bath? Hi Sam! Wondering if it’s possible to do this on high for 5 hours instead of low for 10 hours? Looks like a great recipe! I personally have only ever cooked it on low. For the best flavor I would recommend sticking with the low setting, but it should still turn out if you do it on high. Hi Sam. I made your apple butter and it was yummy. It’s great on toasted English muffins or toast. Thanks for your great recipes. I love your site. The worst choc chip cookies are the best. Everybody wants the recipe wherever I take them. You make the best recipes. Thanks. Kathleen. That’s awesome! I’m glad to hear it! This was the BEST (even tho’ I forgot the vanilla)! I’m making another batch today, and will hot water bath this one. I appreciated the earlier responses to a question about canning this recipe. Soooo, good. I threw in a couple of Granny Smiths to add a little tartness. My mother made apple butter when I was growing up. After making it she would put it in canning jars, pour melted parafin wax on top of the apple butter and put the lids on tight. During the winter we could go get a jar off the shelf and bring up to the kitchen. I don’t remember if she put them in the pressure caner or not. This stuff is so easy and soooooooo good you could put it on the soles of your shoes lick it off and it would still be heavenly!!! This is the second crockpot recipe I’ve tried and this is the best by miles. I would like to tell you all the good things about it but I don’t have the space or time now. I do have a question though, can it be frozen? Thanks so very much for sharing it. Tim and Karen. I think it will be ok in the freezer. Just make sure you leave a little bit of room in whatever container you put it in for it to expand a little bit.